D E S I G N L O V E F E S T » STYLE 38 / GAP! I definitely feel most comfortable in color. And though I usually go for bright dresses, these magenta pants put a fun spin on my personal style. A sheer button-down and a cropped blazer complement the pants’ tomboy silhouette, while an over-the-top pair of platforms and a head full of flowers keep me right in my girly zone. The best of both worlds, really. go see how the other rue ladies styled their sassy Gap items right here! see all the style posts right here! wow! You look soo beautiful! 🙂 This shoot looks so fun! you look amazing, bri! holy cow, two of my faves together i can hardly contain my excitement for you! Love all the colours!!! and cant wait to hear where you got those shoes (gap? ), let me know please!! What an exciting collaboration! These photos are beautiful, I love the outfit you put together and I’m in love with your hair accessories. You look amazing! You make wearing lots of color seem so easy. That second to last picture–you look fantastic!! Gosh, you look amazing!! love all the colour BIG time x. You look fabulous! Everything about what you’re wearing screams awesome! I work as a sale associate for Gap so when I heard rumblings about this collaboration I just about dropped dead I was so excited!! i love the flowers, you seriously look so beautiful!!! This is so awesome, Bri! You guys are rocking it! WOW! You look great — your makeup looks different and I almost didn’t recognize you in the first picture! Very excited for this collaboration! Fun fun fun! You look great! This is such a cool idea from The Gap. I like the way you styled the pants with some GIANT platforms and P.S. Your makeup? Fab! Wow, I LOVE this. Congrats on the amazing collaboration!! There’s so much cuteness in this post I can’t even handle it all! wow, love the pictures and styling, you look great! holy crap I looooove this post! and where oh where did you get your shoes?!? I love how your style pics almost always make you look like a posed doll. Legs at angles, etc. Just adorable! I absolutely love that look! ( : GREAT POST! bri! you look GORGEOUS! no one would rock those magenta’s better than YOU! fab lady! and that ban.do floral headdress? STUNNING! you guys are SO SO SO nice! i am sitting here on the couch with a big smile. thanks for your support on this project! i had a blast shooting it. Bravo darling!!! The color in the this spread is intense and exciting! I LOVE this look! You are absolutely stunning! Congrats on the collaboration! AH-MAZING! You worked it girl. Now please tell me how I get those pants! Gorgeous! seriously love this look. Gorgeous, Ms. Bri! I love The Gap, so I fully support this collaboration *wink*. Congrats to Team Rue! xo. you look sooo lovely, I’ve been wanting bright colored pants for a while, and watching these pictures makes me want to go buy them now! You look absolutely gorgeous. Photos no. 2 and 4 are my favorites. Congrats! one of your best style shoots so far, really like the colours, i’m gonna have to go get me some more! Bri, at first I did’t even recognize you! this make-up is awesome! lookin’ good! please tell me those pants are at Gap?! oh my oh my OH MY!!!! congratulations are in order for you lovely ladies! you deserve it! this shoot is perfection in every way – and your makeup looks ballin’. who did it? Love the polka dot bag. Is it gap? WOW, amazing photos! i love the last two! & great colored pants!! What an AMAZING look! I’m so honored to have my jewelry featured in this fabulous photoshoot. I am LOVING this new tomboy trend! holy cow- this style post is looks amazing. Great job! Are the links down? I can’t acess them. HELP! Love it. Love Gap. Love DESIGNLOVEFEST. I’m so excited about it. Bri you look AMAZING! I totally love your style, especially in this shot–I’m having a lust affair with magenta as of late. It is so awesome to see these great collaborations that give credit to some fabulous and insightful bloggers (yourself included, of course!!). 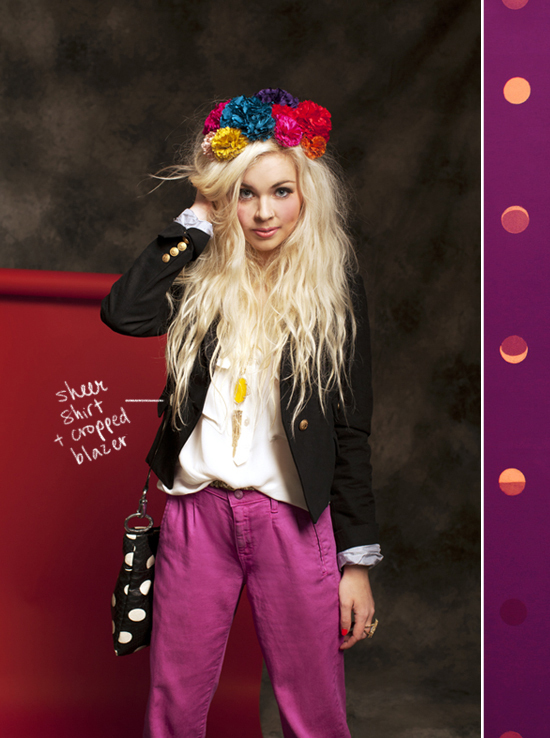 This is such a punchy and playful yet sophisticated look…I think I need to make a quick trip to Gap! OH DEAR PRETTY BRIIIIIIIIIIIIIIIIIIII. YOU GOT ILLUSTRATED, OH MY. So so very lovely. Honestly, the gap is back. Is that purse Gap? I love it. Amazing Style Post. You are a doll Bri! I love the head piece. Congrats on the collaboration with Gap. So so awesome! adorable as always! And congrats on the collaboration with the Gap. Huge! Seriously amazing pics. I think you have another life as a model. So so so so so so so so so so so great. I love this. Perfection. And the ban.dos in your hair are great!! I love this! You look absolutely wonderful, bri! As someone who owns way too many neutrals and not enough color, I love your blog and your style definitely encourages me to be more fearless! Also, you look AH-MAZING. Love love love the flowers in your hair – and the illustration PAPERFASHION did of this photo is absolutely amazing as well! How fun! Love the colors & you look great! Beyond. Darling. Brilliant. Rad. So happy for you guys! Your makeup looks so good! The lipstick, the blush, those are your colors. And your moms comment is the cutest thing in the world and she uses the word uber! Cute people. Love the styling you did for the pants, the pop of orange was delightful! It is so cool to know that the Gap is pairing themselves with bloggers now because they are a vital part to the fashion industry as of late. I love looking at blogs and I know many other people do. Bri! It looks amazing! Love what Gap is doing and I must say… out of all the looks, I loved your the best!! You totally rock these pants. Now I’m heading to Gap this wknd to try them on for myself! Love your style! Bri, that first shot of you is STUNNING! omg i didn’t even RECOGNIZE you! make-up artist = GENIUS. congrats, love! Pretty amazing stuff. You are a true inspiration! PS AND YOU HAIR HOW YOU DO THEM LOOK SO SLEEKY….PERFECT TELL US YOUR SECRETS……. love your style bri…and those ban.do poms!